Talmudic scholar; lived at Damascus in the thirteenth century. He was a pupil of Samuel b. Ali Halevi, the anti-Maimonist. After Maimonides' death he undertook a campaign against the latter's works, which, however, he conducted in a more temperate and judicial spirit than was shown by his master. His criticisms took the form of questions (forty-seven on the "Mishneh Torah" and thirteen on the "Book of Precepts"), which he sent to Abraham, the son of Maimonides. 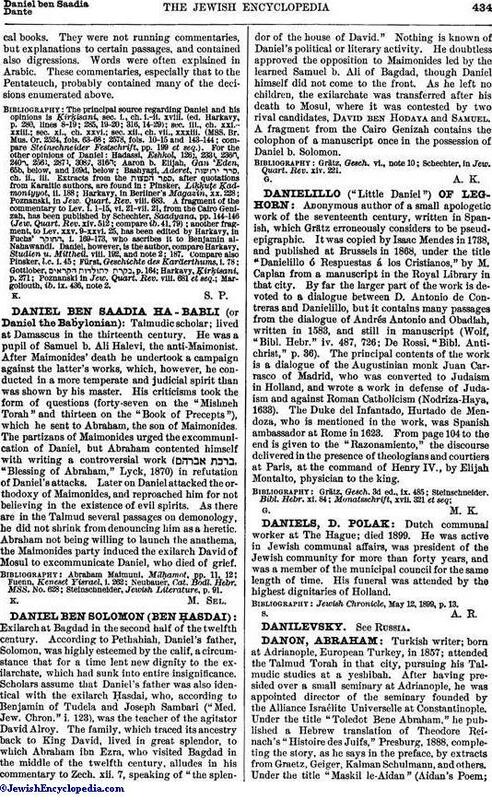 The partizans of Maimonides urged the excommunication of Daniel, but Abraham contented himself with writing a controversial work ( , "Blessing of Abraham," Lyck, 1870) in refutation of Daniel's attacks. Later on Daniel attacked the orthodoxy of Maimonides, and reproached him for not believing in the existence of evil spirits. As there are in the Talmud several passages on demonology, he did not shrink from denouncing him as a heretic. Abraham not being willing to launch the anathema, the Maimonides party induced the exilarch David of Mosul to excommunicate Daniel, who died of grief.